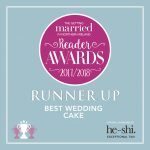 This week I’ve put together a blog totally “un-cake related”! As you may or may not know we have been undertaking some home improvements lately. 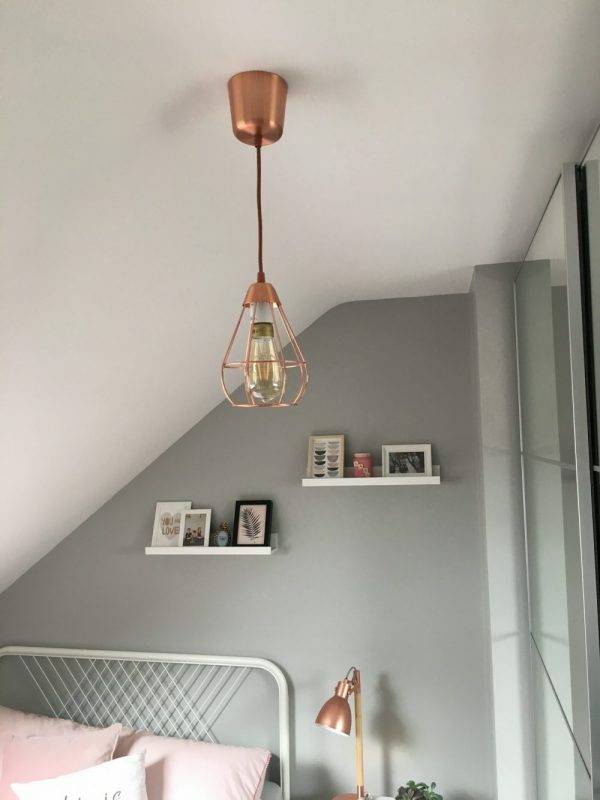 My plan is to share these with you in my blog, so home decor inspiration as well as wedding inspiration. 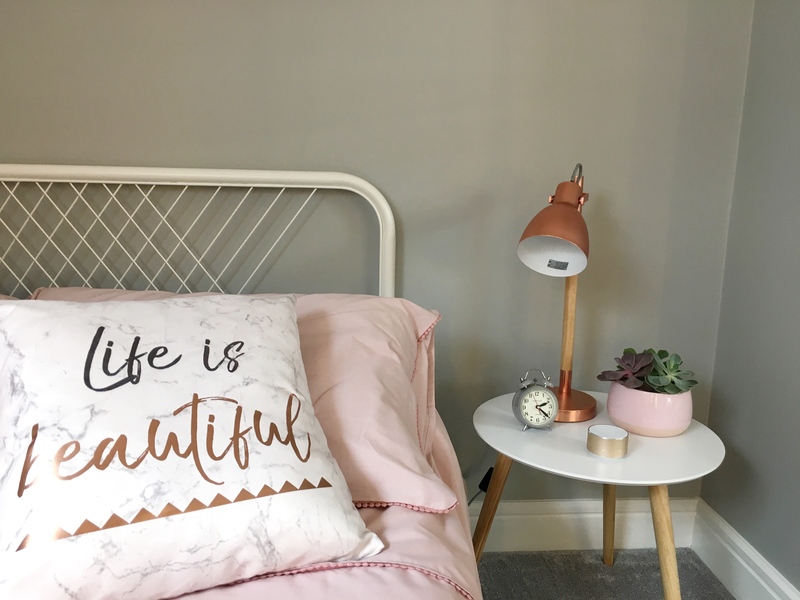 If you follow my Instagram Blog you will know that whilst Olivia (10) was away for a week we completely transformed her bedroom. 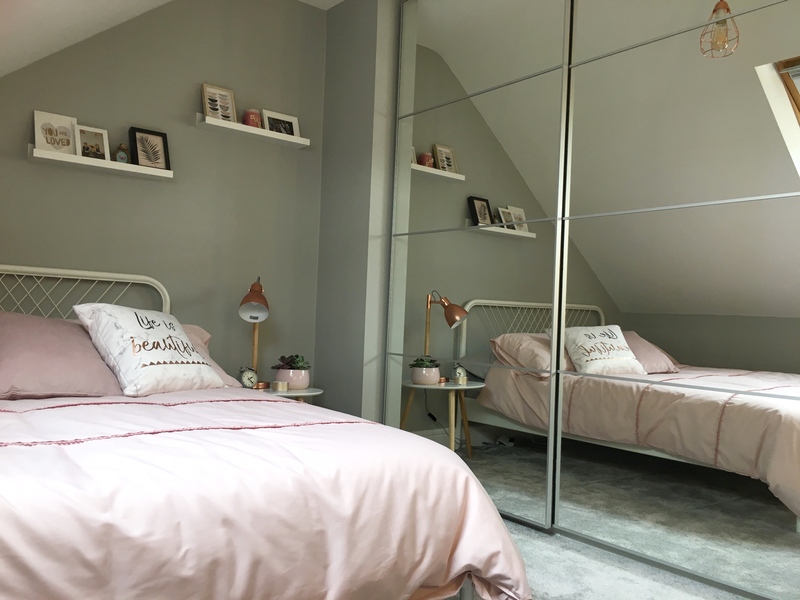 We wanted a more grown up space (teen girl bedroom) that she can grow into! Since then I have received so many messages asking where we got everything so I thought I would share with you. I have linked all the items where possible. 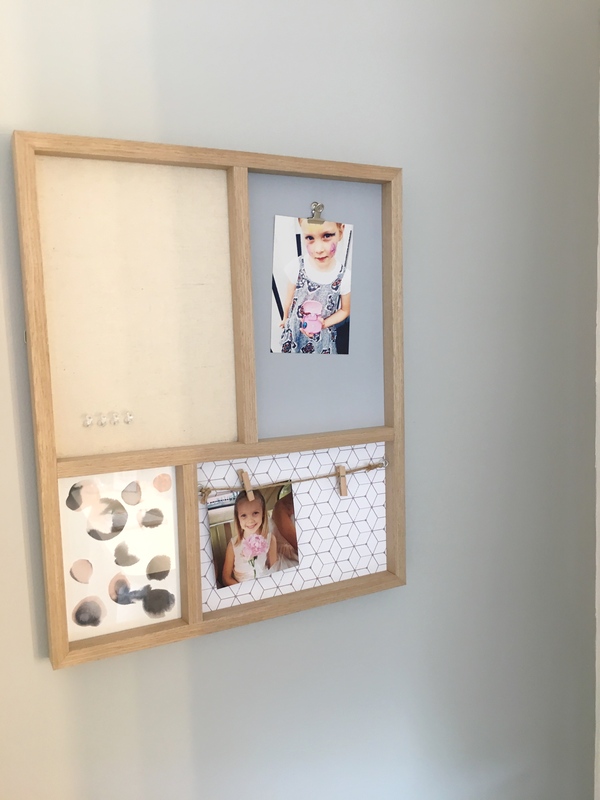 Olivia’s bedroom had the usual… single bed, wardrobe, chest of drawers, blanket box. Once we had all that in there wasn’t room for much else. Of course the walls were pink, the perfect colour for little girls. However, we were more than ready to move on from this! 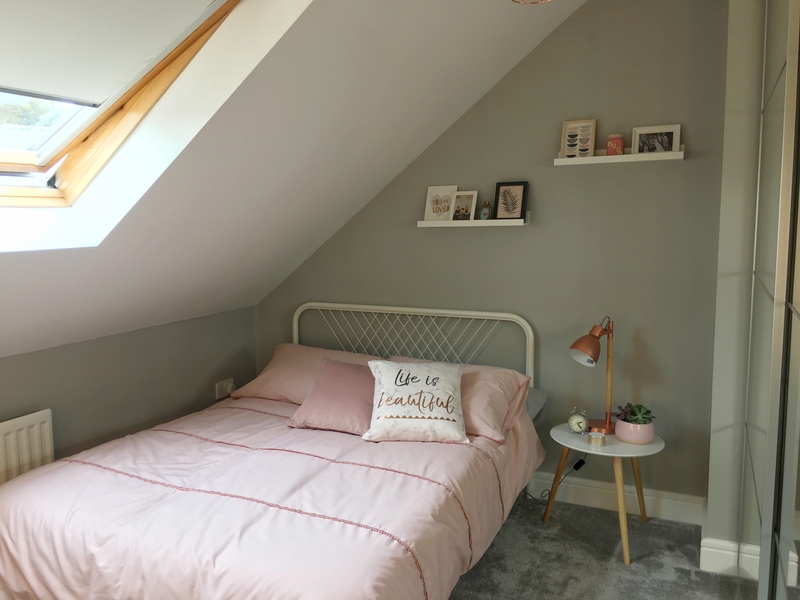 The first thing we did was have her room painted in our chosen colour – Pavilion Gray from Farrow & Ball, we had this mixed using Johnstone’s paint. Painter Guy painted it for us, he did a great job on the woodwork and walls. Next up was the carpet from Smallcost in Ballymena, again it was silver/grey. 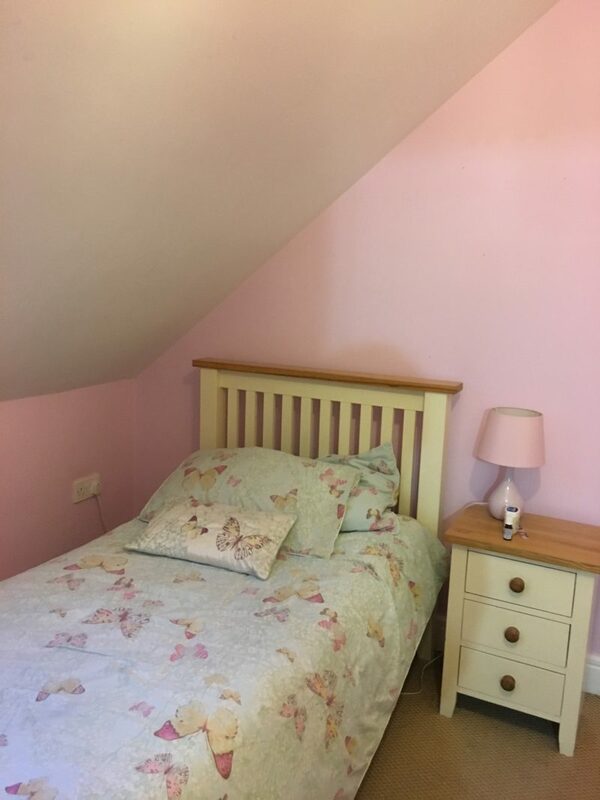 Of course I now want all the bedrooms done…… and yesterday!! Our home is a 4 bedroom semi-detached Georgian style house. Spread over three floors we struggle with a lack of storage. The plan was to create a space that solved this problem using minimal furniture. Olivia had a double bed on her list so we got this one from Ikea and bought the mattress from our local furniture store, Bradley’s. I am so impressed with both! 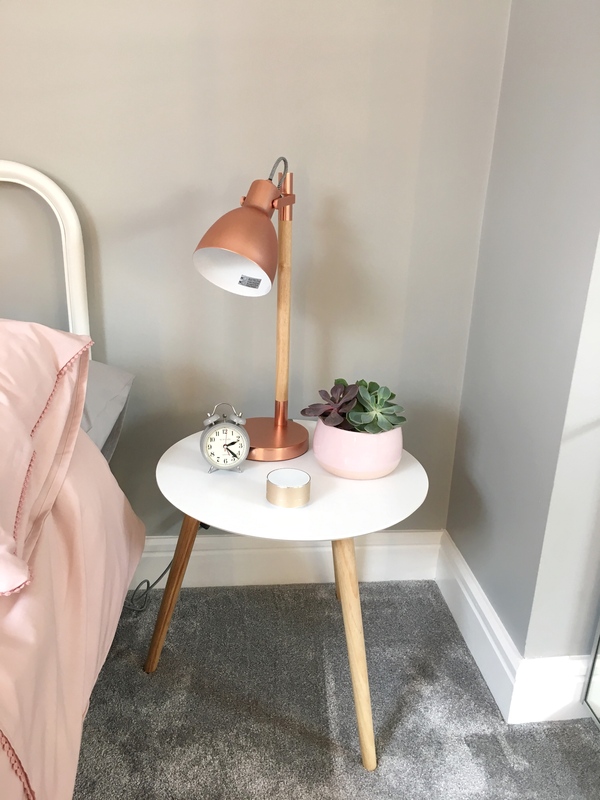 I’m sure drawers would be a more sensible option but I love this bedside table as it creates an illusion of more space. Also I think drawers can become a dumping ground for unnecessary clutter/rubbish! 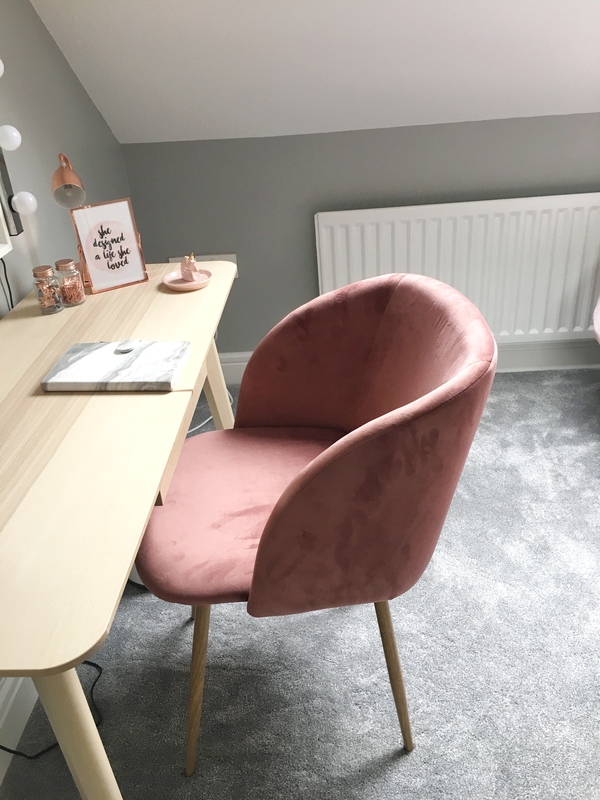 Olivia loves to write and I think the little marble journal from Sainsbury’s was one of her favourite things from her room make over – isn’t it always the littlest thing?! 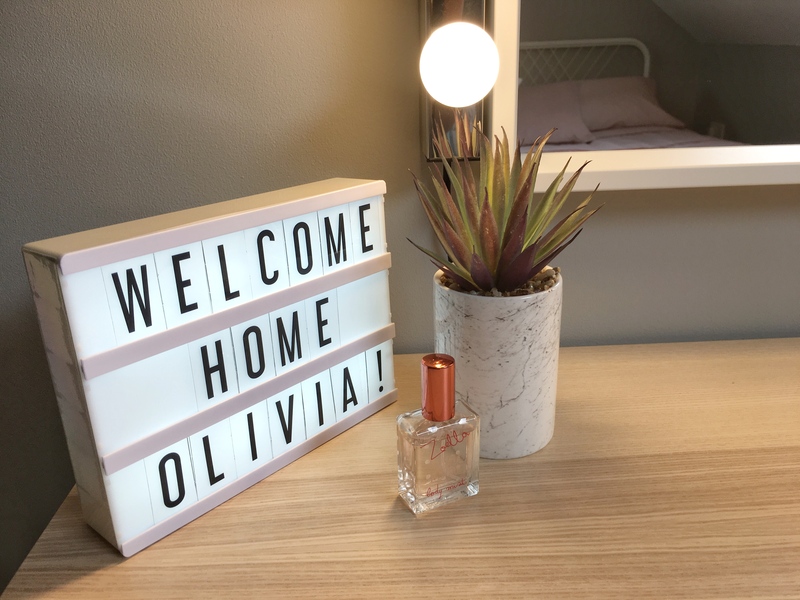 We got this desk to provide the dual purpose of somewhere to do her school work but also the more fun use of somewhere light and bright to do her make up! 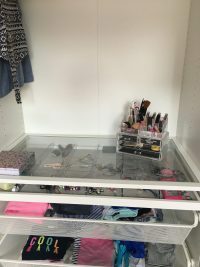 Let’s face it, every girl needs a make up station like this! 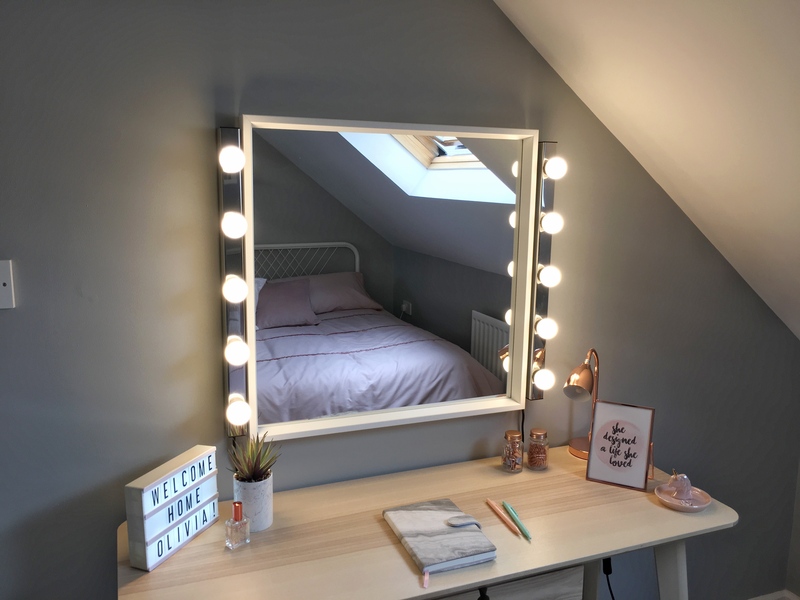 I just love the Ikea mirror and lights that give the look of an expensive mirror for less! I’m thinking I could be sneaking into her room to use this a lot! As it’s a dual purpose desk I didn’t want a typical “office” chair. 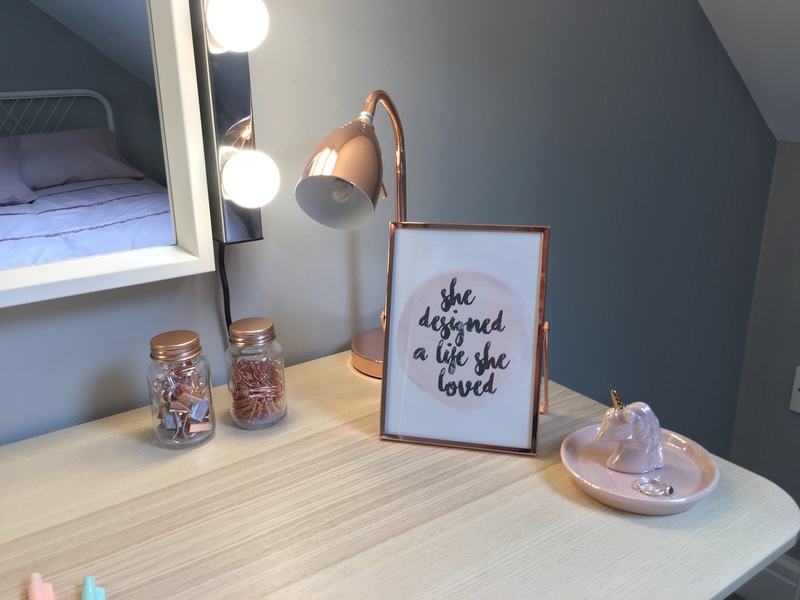 I had been eying these up for ages from a well know high street store with Olivia’s room in mind! When I found out they had stopped selling them I was devastated (actually)! I was straight onto my friend “Google” and found this on Amazon which looks to me like the same chair! It’s absolutely beautiful and so comfortable. It comes in a few colours and I’m trying to think where else in the house I can have one! I thought the best way to reduce the amount of furniture was to incorporate furniture within furniture. Drawers inside a wardrobe with sliding doors. We decided the best place for this would be Ikea, where we chose the Pax Wardrobe. Off we went to Ikea where I thought it would be so complicated to plan what we wanted within the wardrobe. 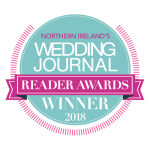 It turns out I was wrong – I know it doesn’t happen that often!! The sales assistant was wonderful, she had our plan together in less than 10 minutes. I do wish it had been so easy and quick to build! John usually quite enjoys building flat pack furniture, this was a big job though! I do think if I was getting another (I would love one for Jack’s room – don’t tell John!) I would enquire how much it would be for the Ikea team to build it! Our fantastic joiner cut the skirting and fixed the wardrobe to the wall for us. 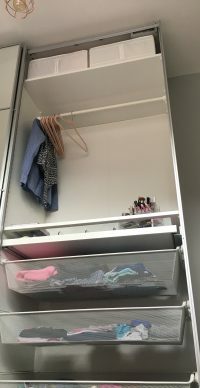 The storage boxes for the top shelves are great for storing out of season clothes, or school uniforms when not in use. They have handles so it means they are easy to lift down and put back up. Hopefully this has been helpful. Please keep up to date over on my daily blog.